It could be argued that blues is all about voice and guitar, so you don't need a modern-sounding drum kit that's going to stand out too much. 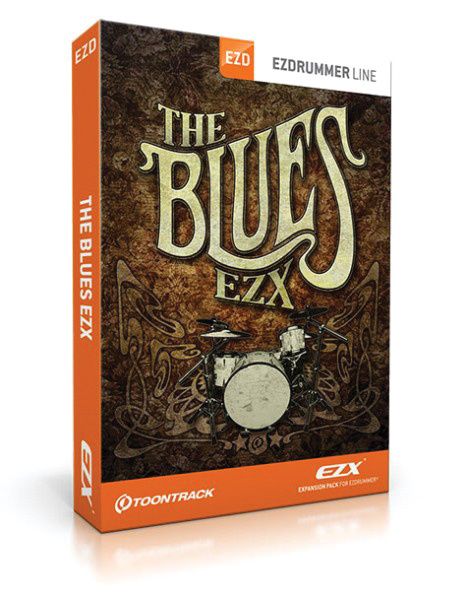 Well, that's certainly the approach Toontrack have taken with Blues, as what you get is an old-school, big bass-drum kit with just two toms, a tambourine and three cymbals to augment the usual kick, snare and hi-hat. The kit itself is miked in a very natural and earthy way, so that it sounds more like a real kit in a real room and less like a fully produced studio recording, and there's a mixer section that lets you add mono ambience, stereo ambience or plate reverb to the overall kit sound. It is less sonically 'constrained' than the Vintage Rock EZX kit, and rather reminds me of the sound of a good-quality home demo recording. Paradoxically, it takes a lot of production skill to get that 'unproduced' sound without losing the quality or musicality of the kit and, as ever, Toontrack have delivered the goods in style. You can get a full list of the kit from Toontrack's web site, but it's worth mentioning the more unusual option of a suitcase in the kick section! As with all EZX expanders, you get a set of drag-and-drop MIDI files suited to the genre, with straight, shuffle and 6/8 time variations. Most of these are gratifyingly unfussy and well suited to a range of blues styles, from Texas shuffle to 'I woke up this morning…'. All the cymbals are of great quality and all the kit parts have enough velocity layers to ensure that crescendos sound seamless. One of the alternate snare-hit mappings has a bit of press-roll bounce to it, and the standard snare hits include a straight hit and a rim shot. There are also alternate nuances for the ride cymbal, different articulations for the crashes, and six open and closed variations for the hi-hat. A well-programmed part sounds as close to a real drummer's performance as you're likely to get. Although this kit doesn't have the definition and impact of something like Toontrack's own Nashville or Drumkit From Hell, it does have a wonderfully organic, easy-going sound that allows it to slot right into a typical old-school blues arrangement. The library's Gretsch kick is roomy and solid, while the huge Levin kick is deep, with a hint of flab. As for the suitcase, it's a low-pitched kind of 'donk' that should work perfectly with more 'rootsy' material.